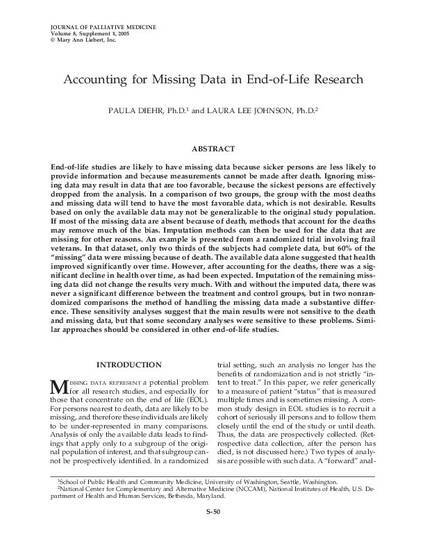 End-of-life studies are likely to have missing data because sicker persons are less likely to provide information and because measurements cannot be made after death. Ignoring missing data may result in data that are too favorable, because the sickest persons are effectively dropped from the analysis. In a comparison of two groups, the group with the most deaths and missing data will tend to have the most favorable data, which is not desirable. Results based on only the available data may not be generalizable to the original study population. If most of the missing data are absent because of death, methods that account for the deaths may remove much of the bias. Imputation methods can then be used for the data that are missing for other reasons. An example is presented from a randomized trial involving frail veterans. In that dataset, only two thirds of the subjects had complete data, but 60% of the "missing" data were missing because of death. The available data alone suggested that health improved significantly over time. However, after accounting for the deaths, there was a significant decline in health over time, as had been expected. Imputation of the remaining missing data did not change the results very much. With and without the imputed data, there was never a significant difference between the treatment and control groups, but in two nonrandomized comparisons the method of handling the missing data made a substantive difference. These sensitivity analyses suggest that the main results were not sensitive to the death and missing data, but that some secondary analyses were sensitive to these problems. Similar approaches should be considered in other end-of-life studies.